Stars And Garters: Friday Night Fights: Battlin' Jack - Round 3: Cloudy With A Chance Of Spidey! Friday Night Fights: Battlin' Jack - Round 3: Cloudy With A Chance Of Spidey! 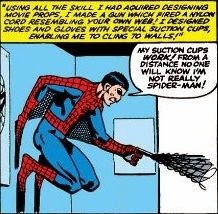 For tonight's round of Friday Night Fights: Battlin' Jack, I'm going to cloud things up a little, courtesy of Amazing Spider-Man#13 by Stan Lee and Steve Ditko. Synopsis: Quentin Beck, a former stuntman, framed Spider-Man for a series of bank robberies, then defeated Spidey on live TV in his own guise of Mysterio, thereby setting himself up as a hero in the eyes of New Yorkers. Here, the Wall-Crawler tracks him down for a rematch. 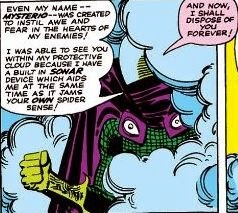 But of course, like a stereotypical James Bond villain, Mysterio stupidly lets Spidey coax him into revealing his plans. 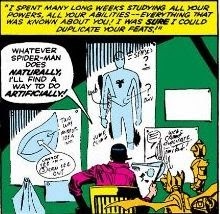 And here he learns why you never disclose your plans to Spider-Man. 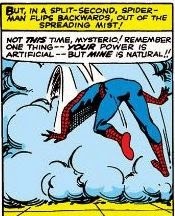 And here ol' Mysty uses the same cloud tricks that let him defeat Spidey before. But this time our Web-Head is prepared. 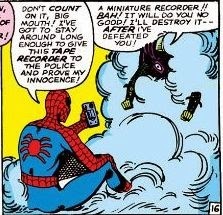 How hard does Spidey's punch connect with ol' Fishbowl-Head? Tonight's fight song comes from Under The Influence Of Giants, a band to whom fellow FNF'er Snell once introduced me. For more cloud-bursts, click here. And don't forget to vote! Gosh, I love it when villains say..."Bah!"